The tragic loss of two brothers is a lot to swallow—and Paul Reed was also taking care of a wheelchair-bound friend. But he had a loving fiancé and friends and family around him. So depression and depletion crept up on him slowly, and the late-night takeout dinners after long days and the soda and chips and ball games on TV took their toll, over time. He had friends who were happy to pick up soda (he drank 3 liters a day) and snacks for him, and friends who were so concerned that they staged an intervention and told him they didn’t want him to die. He wondered what it might take to change and whether it would come down to a “big circus” of police and firemen trying to extricate him from his home. When he stumbled one day and saw that his leg had turned deep red, the prophecy came true. His 911 call summoned enough first responders to close off his street. But it was the doctor who gave the news to him straight: “If you don’t change your life, you’re going to die. Simple as that. Right now, you’re 886 pounds.” Reed didn’t know until that moment how heavy he’d become, and tears streamed down his face. It was time to change. Processing the reality of his situation led Reed to make courageous decisions. Choosing health as his full-time job goes against social convention—even when the alternative is as bleak as it was for Reed. 24Life asked him about making changes on the outside and on the inside and where his journey is leading. 24Life: What was the first step you took, after you got the news? Paul Reed: I gave up soda. [The hospital] started giving me flavored seltzer water. That was just to wean me off the soda. Eventually, you’re going to want to get off the seltzer—all types of bubbled products. We did that, and within a matter of maybe six months, I lost 200 pounds. Two years ago, I had gastric sleeve surgery. They wanted to do gastric bypass, [but] I told them, “No, I want to put the work in,” because the sleeve is slower [acting]; you have to work out and it’s just a tool. 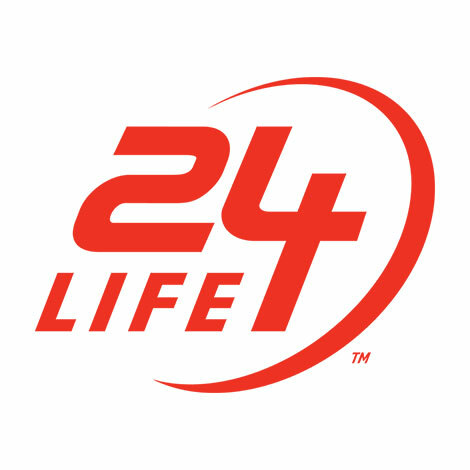 24Life: You joined 24 Hour Fitness in September 2017. Where did you start? PR: I had five personal training sessions with a very good trainer. Then I got introduced to the water through another personal trainer, [and that was] my first introduction to Aqua Bootcamp. I fell in love with it. I leave the house at 6 a.m., and I keep going to the gym like it’s my job. That’s my job, to lose weight [and get healthy]. 24Life: What’s your nutrition regimen? My biggest meal is midday. I come home after the gym and have protein, salad, a vegetable. At night, I have a protein shake, or a grapefruit or something, or just a protein. Nothing heavy at night. 24Life: Where are you on your path to your goal? PR: When I was in the hospital, every day [it] was me saying [to myself], “Look, 10 pounds this week is what I want to lose.” And I kept reminding myself that every time I lost more than a pound, it was toward good health and being able to do something else. Plus, I have godkids that I love dearly … how about being able to go to Disney World? That was one of my goals. Being able to go to Coney Island and get on a ride that I’d normally know I couldn’t get on because of my size. Being able to get on an airplane and not pay for two seats. That was another one of my goals. In total, I’ve lost 565 pounds, and I have another 60 to go because my goal is 260. When I get to that goal, I want to do yoga. I’m able to do things, and it’s a whole different atmosphere and a whole different game. I’m living the opposite of the way I used to live. 24Life: What’s changed for you on the inside? PR: I’ve learned that some of my friends, I guess, wanted me to be the fat friend. And now that I’m becoming the skinny guy … it’s hard for them to process, and I guess they feel like they’ve got competition now. You have to determine who’s temporary in your life, and then if you’re not on the same page, you have to move on. I’m not [going to not] talk to them or reach out to them. But don’t spend 90 percent of your time [with them]. Also, [something] people don’t think about is you can’t have high expectations. Every Monday when I get on the scale, I don’t expect to lose anything. But if I do, I’m happy. If you have high expectations for like, “Oh, I want to lose 5 pounds” but only lose 2, you’ve already disappointed yourself. Another thing I do that is sort of a goal is I buy clothes that are too small with the purpose of getting thinner. How long will it take me to get in them? 24Life: What keeps you going? 24Life: When the going gets tough, do you have a mantra that gets you through it? PR: Persistence overcomes resistance. Every morning, I get up 5 a.m. On certain days, it takes me an hour to get myself together. [But I] take a shower, put my swim trunks on, get my stuff together, get my water, and I’m out the door. And that’s what it takes—you do that every day. A mighty and fiercely curious team focused on creating stories and curating ideas for you.